Many people want a bright, white smile. Unfortunately, habits like smoking, drinking red wine, and even eating chocolate, can all lead to staining of the teeth. 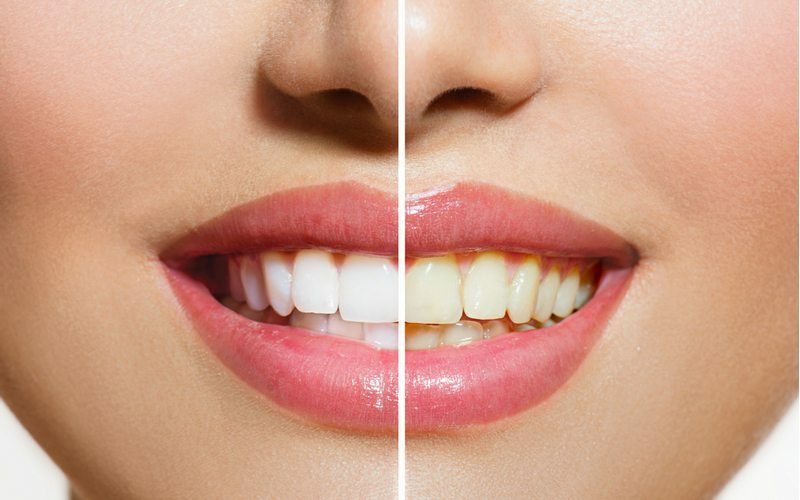 Teeth whitening is a great way to combat staining and get your teeth to a nice white shade that makes you feel confident and happy with the way you look. But first, let’s clear up one common misconception about teeth whitening. Teeth whitening is very safe. Older treatments used to have a high level of acidity, which wasn’t good for teeth, but today’s in-office and over the counter treatments are all neutral and completely safe for your teeth. The only thing you might notice is an increase in sensitivity to hot and cold foods and beverages, however, that can be treated through the use of a sensitive toothpaste. So, what’s the difference between in-office and at home teeth whitening options? Over the counter teeth whitening options like at home gel trays or Crest white strips are great. They’re a wonderful option for someone who wants to do the teeth whitening process in the comfort of their own home. However, these options aren’t as strong as in-office procedures, which means they can take longer to get results. Additionally, OTC options aren’t customized to fit your mouth, so you have the potential to miss certain teeth and end up with uneven whitening. Whitestrips, for example, only hit the first six teeth or so. And whitening gel trays might fit awkwardly since they aren’t molded to your mouth’s anatomy. As a rule of thumb, avoid anything OTC that claims to give you immediate results. OTC whiteners are not strong enough to provide immediate results to users. Professional teeth whitening promises you the fastest results possible, while under the care of a dentist. As a result, we use stronger formulas that are safe for your teeth and give us the ability to more closely control your results. Typically we can get your teeth to your desired shade of white faster and in fewer treatments than what you might find with at home treatments. We also used trays that are custom made to fit your mouth, so every tooth is whitened and given maximum coverage with the gel. One of the biggest perks of professional whitening is that you get the counsel of Dr. Pendleton. So if you have any crowns or tooth colored fillings he can determine the best way to get all teeth to match in shade.